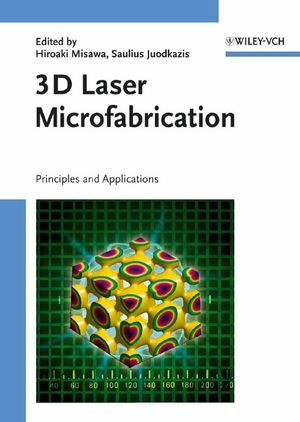 A thorough introduction to 3D laser microfabrication technology, leading readers from the fundamentals and theory to its various potent applications, such as the generation of tiny objects or three-dimensional structures within the bulk of transparent materials. The book also presents new theoretical material on dielectric breakdown, allowing a better understanding of the differences between optical damage on surfaces and inside the bulk, as well as a look into the future. Chemists, physicists, materials scientists and engineers will find this a valuable source of interdisciplinary knowledge in the field of laser optics and nanotechnology. Hiroaki Misawa is Professor at the Research Institute for Electronic Science at Hokkaido University, Sapporo, Japan. He obtained his B.Sc. in Engineering from the Department of Engineering at Tokyo Metropolitan University in 1979, graduated in Engineering from the University of Tsukuba in 1981 and completed his Ph.D. at the Department of Chemistry there in 1984. After postdoctoral positions at the Universities of Texas and Tsukuba and an Assistant Professorship at Tsukuba, he joined the Micro-photo-conversion project (Exploratory Research for Advanced Technology ERATO of Japan Science & Technology Agency JST). He then moved on to the Department of Engineering at the University of Tokushima in 1993 and was promoted to full professor in 1995. His current research interests include photochemistry, light-matter interaction, ultra-fast processes in materials, photonic crystals, and plasmonics. He has authored more than 200 papers. Saulius Juodkazis is Associate Professor at the Research Institute for Electronic Science at Hokkaido University, Japan. He received his Physics Diploma in 1986 from Vilnius University, Lithuania, and was later confered a lecturer qualification in Physical Sciences. In 1997, he received his Ph.D. in Physics and Material Science jointly from Vilnius University and l'Universitä laude Bernard in Lyon, France, on the structural and optical properties of CdS doped waveguiding sol-gel films. From 1994, he worked as a researcher at the Semiconductor Physics Department, currently Institute of Material Science and Applied Research, of Vilnius University, and from 1997 to 2000 carried out post-doctoral research at Tokushima University, Japan. His current interests include space-time-spectrum-resolved characterization of light-matter interactions in micro-domains, nano-photonics/plasmonics, laser tweezers, and applications of ultra-fast laser pulses. He has published and co-authored more than 90 scientific papers. 1 Introduction (Hiroaki Misawa and Saulius Juodkazis). 2 Laser–Matter Interaction Confined Inside the Bulk of a Transparent Solid (Eugene Gamaly, Barry Luther-Davies and Andrei Rode). 2.2 Laser–matter Interactions: Basic Processes and Governing Equations. 2.3 Nondestructive Interaction: Laser-induced Phase Transitions. 2.4 Laser–Solid Interaction at High Intensity. 2.5 Multiple-pulse Interaction: Energy Accumulation. 3 Spherical Aberration and its Compensation for High Numerical Aperture Objectives (Min Gu and Guangyong Zhou). 3.1 Three-dimensional Indensity Point-spread Function in the Second Medium. 3.2 Spherical Aberration Compensation by a Tube-length Change. 3.3 Effects of Refractive Indices Mismatch-induced Spherical Aberration on 3D Optical Data Storage. 3.4 Effects of Refractive Index Mismatch Induced Spherical Aberration on the Laser Trapping Force. 4 The Measurement of Ultrashort Light Pulses in Microfabrication Applications (Xun Gu, Selcuk Akturk, Aparna Shreenath, Qiang Cao, and Rick Trebino). 4.3 FROG and Cross-correlation FROG. 4.4 Dithered-crystal XFROG for Measuring Ultracomplex Supercontinuum Pulses. 4.5 OPAXFROG for Measuring Ultraweak Broadband Emission. 4.6 Extremely Simple FROG Device. 5 Nonlinear Optics (John Buck and Rick Trebino). 5.1 Linear versus Nonlinear Optics. 5.3 Some General Observations about Nonlinear Optics. 5.4 The Mathematics of Nonlinear Optics. 6 Filamentation versus Optical Breakdown in Bulk Transparent Media (Eugenijus Gaiz&acaron;uskas). 6.2 Conical Waves: Tilted Pulses, Bessel Beams and X-type Waves. 6.3 Dynamics of Short-pulse Splitting in Nonlinear Media with Normal Dispersion: Effects of Nonlinear Losses. 6.4 On the Physics of Self-channeling: Beam Reconstruction from Conial Waves. 6.6 Filamentation Induced by Conical Wavepacket. 7 Photophysics and Photochemistry of Ultrafast Laser Materials Processing (Richard F. Haglund, Jr.). 7.2 Ultrafast Laser Materials Interactions: Electronic Excitation. 7.3 Ultrafast Laser-materials Interaction: Vibrational Excitation. 7.4 Photochemistry in Femtosecond Laser-materials Interactions. 7.5 Photomechanical Effects at Femtosecond Timescales. 7.7 Future Trends in Ultrafast Laser Micromachining. 8 Formation of Sub-wavelength Periodic Structures Inside Transparent Materials (Peter G. Kazansky). 8.2 Anomalous Anisotropic Light-scattering in Glass. 8.3 Anisotropic Cherenkov Light-generation in Glass. 8.4 Anisotropic Reflection from Femtosecond-laser Self-organized Nanostructures in Glass. 8.5 Direct Observation of Self-organized Nanostructures in Glass. 8.6 Mechanism of Formation of Self-organized Nanostructures in Glass. 9 X-ray Generation from Optical Transparent Materials by Focusing Ultrashort Laser Pulses (Koji Hatanaka and Hiroshi Fukumura). 9.2 Laser-induced High-energy Photon Emission from Transparent Materials. 9.3 Characteristics of Hard X-ray Emission from Transparent Materials. 10 Femtosecond Laser Microfabrication of Photonic Crystals (Vygantas Mizeikis, Shigeki Matsuo, Saulius Juodkazis, and Hiroaki Misawa). 10.1 Microfabrication of Photonic Crystals by Ultrafast Lasers. 10.2 Photonic Crystals Obtained by Direct Laser Writing. 10.3 Lithography by Multiple-beam Interference. 11 Photophysical Processes that Lead to Ablation-free Microfabrication in Glass-ceramic Materials (Frank E. Livingston and Henry Helvajian). 11.2 Photostructurable Glass-ceramic (PSGC) Materials. 12 Applications of Femtosecond Lasers in 3D Machining (Andreas Ostendorf, Frank Korte, Guenther Kamlage, Ulrich Klug, Juergen Koch, Jesper Serbin, Niko Baersch, Thorsten Bauer, Boris N. Chichkov). 12.4 Nonlinear Effects for Nano-machining. 13 (Some) Future Trends (Saulius Juodkazis and Hiroaki Misawa). 13.2 On the Way to the Future. 13.4 The Future is Here.